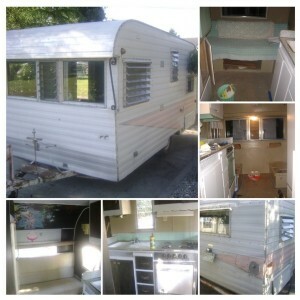 Although the travel trailer was attractive to start with, Tiffany wanted to put her own personal touches on it. For 52-years-old, Pinkie was in fairly good shape, but still suffered from the typical rust and wear that a camper of that age features. Also, even though there was a only a light-pink accent on the lower half, as a life-long fan of Audrey Hepburn, Tiffany wanted to really push-the- envelope with the signature color. Refreshing the white paint provided a perfect base for what she did next. 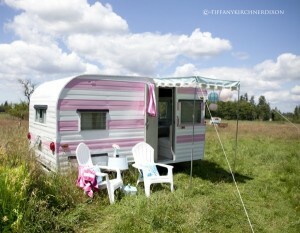 When she painted pink “cotton-candy” stripes, up the sides and across the back, it made the little camper really pop! A personalized license plate, with the camper’s new name on it, hung proudly below the back window (which sported a decal of interlocking horseshoes for good luck). 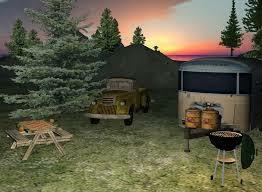 While many owners go the “rustic route” for their outdoor seating, Tiffany decided to do something different. 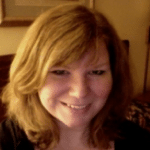 She wanted to bring the same care and attention-to-detail, with which she chose the exterior color scheme and the interior decor, to the camper’s outside seating area. 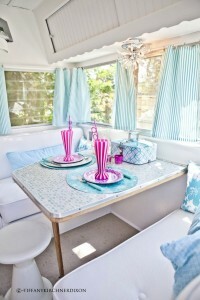 She decorated the area with pretty accents and comfortable seats to greet company. 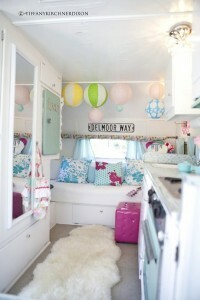 The chairs were white to match the base paint of the camper. White and aqua throw pillows were added for a homey touch and matched the color of the awning, thus finishing off the color and decor scheme. The ensemble was completed with a small table, to hold her food and beverages. When she first obtained Pinkie, the original interior consisted of black paint, with neon accents, and beige bench seats. With multiple areas of wear and rust, a make-over was definitely needed! Tiffany decided to bring the exterior color scheme to the inside. She didn’t want to completely change the bones of the camper, so the 1950s gray-specked flooring, enamel icebox and aqua-colored counter tops remained from the original decor. The remainder was overhauled. The initial, dark cabinet fronts were given a face-lift and painted white. This opened up the area, giving the illusion of more space. The kitchen table and counters were changed to white, with dashes of aqua throughout, to complement an aqua-colored splashguard. To make the area more modern, new door knobs and hardware were installed on all the doors and drawers. The beige seats, in the dining area, were covered with a white, vinyl, faux-ostrich material, making this the posh place to be when she was entertaining! 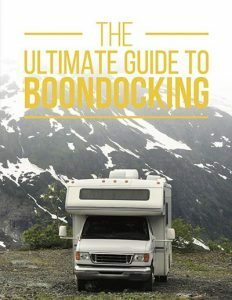 Many campers and motorhomes are produced with a neutral color scheme, to cater to the greatest number of possible consumers. This allows the owners to pick accents in colors of their own preference, without worrying they will clash with the existing decor. 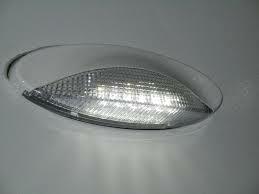 They usually are equipped with relatively generic-looking light fixtures, as well. Proper lighting is very important in any abode, but even more so in a small space. Obtaining the greatest amount of illumination, with the least amount of floor, wall or ceiling space used, is essential to maintaining an open living area. 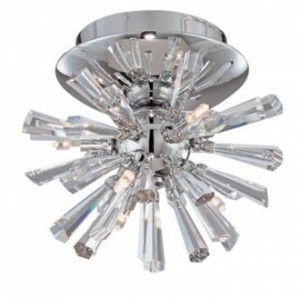 One of Tiffany’s biggest investments was a funky, multi-bulb light fixture that she installed on the ceiling. This provided a lot of light and added an interesting accent that complemented the overall design, as well. She also found some beautiful, Asian fabric at a vintage RV flea market in Georgetown, Washington. Aqua and white-striped curtains were made for the windows; these balanced the aqua-and-white throw pillows that accented the bed and bench seats. 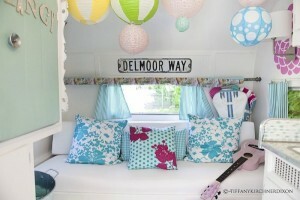 Once the major decisions were made, Tiffany increased her creative design to new levels, to focus on personalizing the camper with unique accessories. 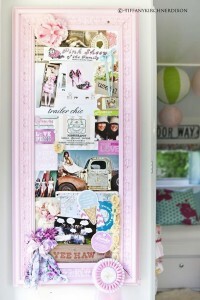 To showcase her nostalgia items, such as mementos and family photos, she incorporated a pink pin-board. A used, pink guitar, provided by a close friend, became a special design element. 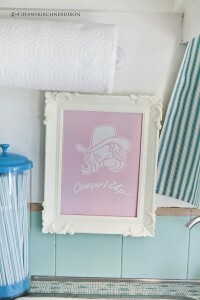 Placed in the primary area for entertaining, it was given added significance when Tiffany coupled it with a decal sporting one of her favorite phrases–“cowgirl up”. She added inspirational accessories to the tables and walls. White frames held motivational, whimsical images and statements, in aqua and pink. She carefully set the table with pink and white candy-striped soda fountain glasses, with matching pink, crazy straws. These were placed atop pink plates with intricate designs, which in turn, were centered on decorative aqua place-mats with aqua-handled dinnerware. This is where Tiffany preferred to hang out when entertaining her gal-pals. Tiffany’s project was a labor of love. What started out as incorporating a few updates and a bit of added personality, quickly became an obsession. Every inch of Audree has become a point of pride for her new owner. 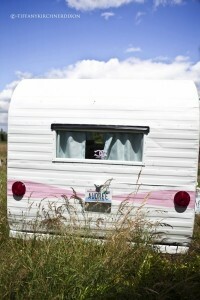 Whether owning a pink camper is on the bucket list or not, it is difficult not to admire the amount of determination and effort she undertook to accomplish this fabulous result. A renovation job can take an hour, a weekend or a lifetime, but each improvement, whether large or small, has the potential to entirely change the appearance and feel of a travel trailer or motorhome. So, what are you waiting for?